Take part in a research-led physical geography programme and have an excellent, world-class learning experience. Massey’s Master of Sciences (Geography) will give you the knowledge and skills to understand and help solve some of the world’s most important environmental issues like flooding, coastal erosion, sea level change, landslide hazards and environmental change. You will have access to a wide range of techniques and equipment, making it easier to progress your research in a timely and comprehensive fashion. From ground survey equipment like a Trimble RTK differential GPS and S6 robotic total station and a ground penetrating radar to a range of coring apparatus e.g., lake/bog corers, percussion corer and vibracorer and Schmidt hammers for relative age dating of boulders we have the specialist equipment to help your research meet global standards. Our strong relationship with industry and councils and the masters programmes research element make our graduates very attractive to potential employers such as environmental consultancies and regional councils. Let our experts help you develop your own expertise. Massey’s geography lecturers have an extensive range of experience and expertise. The ratio of staff to students is high. Your lecturers will be your mentors, working alongside you to fully engage you in the practical and theoretical aspects of advanced physical geography study, to prepare you for life in the workplace in a specialist sense or preparing you for research at a higher level. Postgraduate study is hard work but hugely rewarding and empowering. The Master of Science will push you to produce your best creative, strategic and theoretical ideas. The workload replicates the high-pressure environment of senior workplace roles. Our experts are there to guide but if you have come from undergraduate study, you will find that postgraduate study demands more in-depth and independent study. Some courses in the geography major are taught in block mode, which means you come onto campus for a period. This gives you the opportunity to come to Massey for a semester and spend valuable time with lecturers and fellow students in lectures, seminars, student-led presentations and seminars, lab work, field work day trips, small group discussions, and residential field work. Postgraduate study is not just ‘more of the same’ undergraduate study. It takes you to a new level in knowledge and expertise especially in planning, time management, setting goals and milestones and undertaking research. The Master of Science (Geography) may comprise a selection of courses from across both physical and human geography. However, normally students taking this programme will focus on physical geography and it is this experience that is described in these pages. Students should also consult the Master of Arts (Geography) programme pages for a description of the equivalent experience in human geography. A willingness to take responsibility for learning. I love knowing how things work. In particular, the natural processes we take for granted such as volcanoes, landslides, tsunamis, and earthquakes. I chose to study a master’s in geography as I was initially studying earth science as an undergraduate and realised that the geography papers on offer greatly complemented the earth science papers I was studying. The processes occurring on Earths' surface are directly influenced by the processes going on underneath our feet and understanding how these interact with each other helps shape a full picture of how our Earth works. I am currently working at Geotechnics in Auckland as a Senior Geophysical Investigation Specialist and training to be a Project Manager for the Geophysics team, which I helped get off the ground. The field work component of my geography studies greatly set me up for everything I do here. This role is a continuous challenge and I am learning non-stop. We are even encouraged to study further and have access to a full library with all the important geotechnical journals. Dr Katherine (Kat) Holt’s research interests focus on palynology (pollen analysis) and tephrochronology (using volcanic ash layers for dating). Dr Holt’s PhD was the first work to comprehensively document the Quaternary history of the Chatham Islands, a region which also continues to feature strongly in her research interests. Her work on tephras in the Chathams has demonstrated that ash from even minor eruptions can travel very long distances, and that there is considerable potential for the New Zealand tephrochronological framework to be expanded. 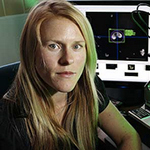 Dr Holt is also heavily involved in research and development towards the first holistic system for automatic identification of pollen, and she sits at the forefront of this newly emerging field of automated palynology.